A geometrical shape with two parallel straight sides having two circular parts such that one is at the top and the other is at the bottom. This one is a solid which is being generated by rotating of rectangle about one of its sides.Consider the rectangle PQRS which is rotated about its side PQ and makes one complete rotation to reach the initial position.This rotation creates a right circular cylindrical solid. Each and every of this right circular cylindrical solid is having two plane endings.The end of each plane is in a circular shape and the endings of the planes are parallel.End of each plane is known as the base of the above right circular cylindrical solid. A straight line that joins the centers of those two planes is called the axis.The radius of the base circle is called as the radius of the right circular cylindrical solid. The curved surface which joins the two planes ending is the lateral surface-area or curved surface-area. In the above picture,the letters, "r" represents radius and "h" represents height. A solid which is being formed by two co-axial piston chambers with the same height and same radii is called as hollow-cylindrical solid. Here "R" says the external radius and "r" says the internal radius of the cylinder. In the above picture of a hollow-cylindrical shape, the green colored line represents an internal radius,the red colored line represents an external radius and the yellow line represents the height of the hollow cylindrical solid. When we want to find areas and volumes , these two values "r" and "h" that radius and height plays a vital role. When we know the radius and height, we can use the formula and find the areas and volumes. 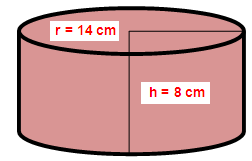 A solid right circular cylinder has radius of 14 cm and height of 8 cm. Find its curved surface area and total surface area. After having gone through the stuff given above, we hope that the students would have understood this topic. Apart from the stuff given above, if you want to know more about "Cylinder", please click here.